Bayer is committed to advance science and practiceoriented approaches that contribute to cattle health and wellbeing. Bayer reinforces its commitment to enhancing cattle health and management by supporting cattle professionals around the world with scientific education and technological advancements. At the recent 30th World Buiatrics Congress in Sapporo, which brought together over 2,000 global cattle experts, Bayer launched new tools to help advance cattle well-being in practice-oriented ways. Inviting experts to discuss key topics fundamental to cattle health and well-being, the International Bayer Cattle Symposium took place alongside the Congress. Topics covered included optimizing treatment of bovine respiratory disease (BRD), bovine coccidiosis management, metabolic health in transition cows and calf nutrition. The program also included a roundtable discussion to establish how cattle well-being can be further advanced with a collaborative approach between stakeholders. Bayer also introduced new practice-oriented tools to support livestock professionals to further advance cattle health and well-being: i-COWNT BRD, a digital comparison tool for different antibiotics used for the treatment of bovine respiratory disease (BRD); and two Practical Animal Well-Being brochures for better on-farm handling of beef and dairy cattle that were developed in collaboration with independent cattle well-being experts and the World Farmers’ Organisation. In keeping with its leadership in ectoparasite control, Bayer also introduced the concept and importance of customized parasite control through Virtual Farm, an educational virtual reality experience of flies, the various types and their impact on cattle. These were showcased alongside Bayer’s Calf Resilience Program and the BCS Cowdition smartphone application for scoring the body condition of dairy cows. 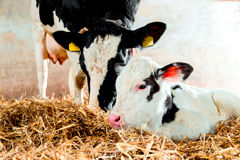 At the congress, Bayer presented 11 scientific posters, covering parasite control, susceptibility monitoring of antibiotics used in the therapy of mastitis and respiratory diseases, and a survey of the prevalence of subclinical ketosis during early lactation world wide, amongst others.